Norland Leicester Log Cabin: The Norland Leicester Log Cabin features single windows in the front wall. These are rather higher than most similar buildings. The point of this is to allow an office desk or a table to be positioned under the window inside the Log Cabin such that it cannot be seen from the outside making this building perfectly suited to being a garden office or a hobby room. The window in the gable end wall is ideal for allowing in additional light. The cabin can be built with that window in either gable end. 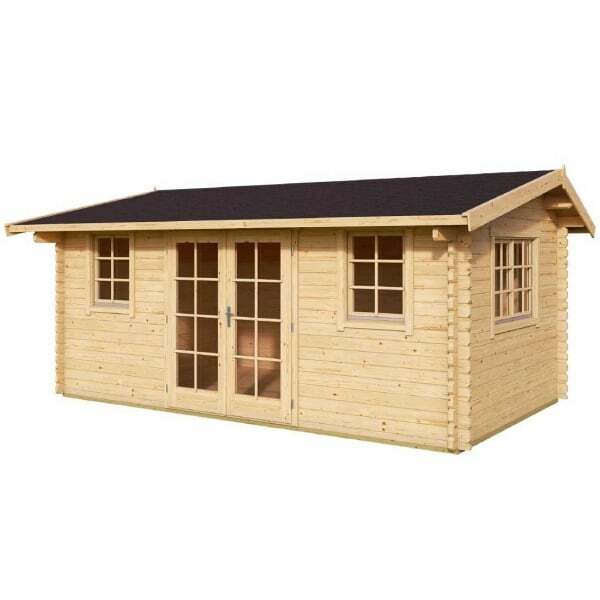 Featuring its lower ridge the Lancaster is a low ridge log cabin specifically designed to comply with the UK planning authority’s lower ridge requirements where appropriate. Manufactured using 44mm wall logs and are double glazed this style of cabin is an ideal all-year – round summer house or garden office etc. The window bars shown on the above image can be removed during assembly if you prefer the larger open single pane style glazing.